In recent development in engineering, researchers and scientists are more interested in precision manufacturing, assembly and manipulation of small parts. For manipulation and assembly of small parts, microgripper is the key component to handle microsized objects with precision at the micron level. The design of microgripper is required to consider many aspects of microphysics. Microgripper is functionally divided into two divisions such as mechanism part and gripping jaw segment. 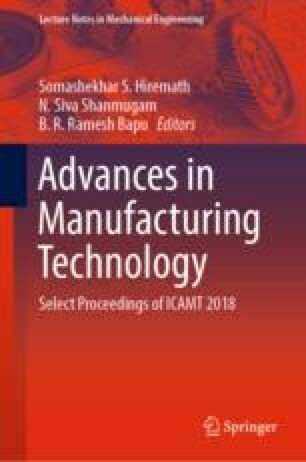 This research paper mainly focuses on devising the mechanism segment of a microgripper which basically transfers the motion in precise and controlled manner and is generally complicated to design. Topology optimization is utilized to design a compliant mechanism for a microgripper since it is the best choice for microlevel actuators. Topological optimized design is required for performing post-processing and removing the staircase effect and node-to-node connectivity developed during design. Various filtering and interpolation methods are adopted to minimize the limitations of topology optimization and also to generate mesh independence and perfect boundary. Finite element method (FEM) is used to analyze the microgripper developed through topology optimization technique, and the results are compared with a rigid body model which is equivalent of the mechanism. Graphical position analysis is also carried out to find the output displacement of an equivalent rigid body model of microgripper mechanism. Science and Engineering Research Board (SERB), India (Grant Number ECR/2016/001938), has supported this work.